Illstreet Composites provides a service whereby they will redesign an existing Aluminum and Steel Dial Table from Composite Materials. 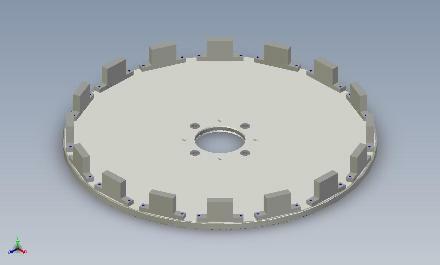 A replacement Composite Dial Table is required to fit into the same working envelope has the existing Dial Table. This usually means that Dial Table thickness must be accounted for in the design. 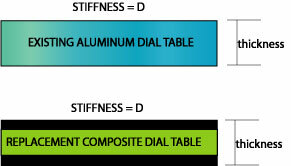 In addition the replacement dial table should have a value of stiffness comparable to the existing Dial Table. The replacement Composite Dial Table must have the same radial stiffness D and thickness as the existing Aluminum Dial Table. To achieve the same stiffness a Special Ribbed Carbon Dial was designed. 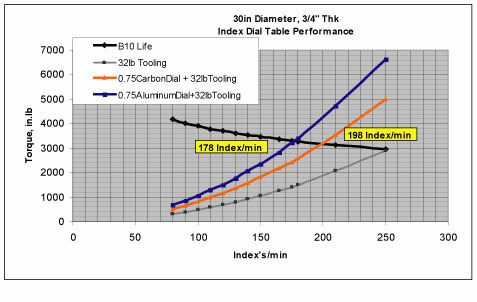 To show index/min performance, an Aluminum and Special Ribbed Carbon Dial Table was compared. A total tooling load of 32lbs (2 lb per tool/16 stations) was applied at the perimeter of each dial table. The B10 life was calculated using proprietary indexer manufactures equations. Illstreet reduces the B10 life by 50%. The Aluminum Dial Table had a maximum performance of 178 index's/min. The Special Ribbed Carbon Dial Table had a maximum performance of 198 index's/min. The Special Ribbed Carbon Dial Table increased the index's/min by 20, a 11.2% increase. An Aluminum Dial Table redesigned from a Special Ribbed Composite Material. The Special Ribbed Carbon Dial Table had the same Thickness and Radial Stiffness as the Aluminum Dial Table that it replaced. CONTACT Illstreet to discuss the feasibility of re-designing existing Aluminum or Steel Dial Table products from SPECIAL RIBBED CARBON DIAL MATERIAL.